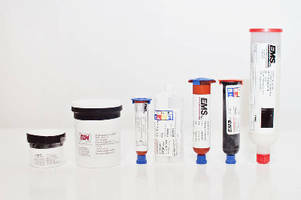 UV Cure Adhesive suits circuit assembly applications. Designed to cure rapidly when exposed to high-intensity UV light, 535-11M-7 Epoxy is suitable for lens bonding in camera modules, chip encapsulation in smart cards, and variety of general bonding applications in photonics assembly. Flexible, high-strength epoxy adhesive is non-conductive, low-outgassing, and does not contain antimony. DELAWARE, OH-- Engineered Material Systems, a leading global supplier of electronic materials for circuit assembly applications, is pleased to debut its 535-11M-7 UV cured epoxy. 535-11M-7 was developed to pass the rigorous reliability requirements in disk drive, camera module, photonics and circuit assembly applications. 535-11M-7 is an ultra-low stress, lower glass transition temperature version of the 535-10M-1 UV cure adhesive. The material can be used for lens bonding in camera modules, chip encapsulation in smart cards and a variety of general bonding applications in photonics assembly. The new non-conductive UV cured adhesive cures rapidly when exposed to high intensity UV light. 535-11M-7 is a low outgassing, extremely flexible, high strength epoxy adhesive that does not contain antimony. 535-11M-7 is the latest addition to Engineered Material Systems’ extensive line of electronic materials for semiconductor, circuit assembly, photovoltaic, printer head, camera module, disk drive and photonic applications. For more information about the 535-11M-7 UV curing adhesive or to learn how Engineered Material Systems can define, develop and create an engineered material solution that is right for your company, visit www.emsadhesives.com.